Oceanfront Akumal Condo for Sale - $355,000\r\rThis spacious, cheerfully appointed condo is located on the third level of Hacienda de La Tortuga overlooking the pool and the sparkling waters of Akumal's Half Moon Bay.\r\rThis bright, airy vacation home has an open living plan with terrific views from the kitchen, living and dining areas. The condominium offers 2 bedrooms, each with king-sized bed and private bathroom with shower, detailed with traditional Mexican tile. The master bedroom also has a giant sunken bathtub. The kitchen is fully equipped and includes a breakfast bar for extra dining seating. From the main living area, there are sliders that open out onto an expansive oceanfront terrace, affording amazing views out over the bay. There is plenty of space for relaxing, alfresco dining, and generally enjoying the warm Caribbean climate and spectacular views of the bay. There is also a balcony off the guest bedroom facing the mangroves. This is the only residence in the building with this feature.\r\rHacienda de la Tortuga is located in the northern central part of Half Moon Bay, within walking distance of plenty of amenities or even a short bike ride from the village at the main bay with all its fantastic restaurants and boutiques. The Hacienda de La Tortuga complex features a lovely pool and plenty of lounging space on the sandy beachfront, which is dotted with palapas for shade. The bay just in front of the condo is great for snorkeling as the reef comes very close to the shore. The reef is home to a wide diversity of marine life including the endangered sea turtles that call Akumal home! Hacienda de La Tortuga is also home to the gourmet restaurant, La Lunita, renowned as one of the very best in all of the Riviera Maya.\r\rLa Tortuga 7 is offered for sale fully furnished and equipped for immediate occupancy. 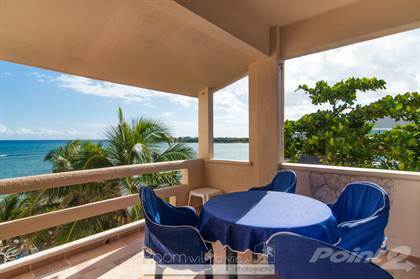 This condominium has performed very well on the vacation rental market with people coming back year after year to enjoy its location and amenities. Whether you are looking for a vacation home, a place to retire or just a savvy investment in Akumal real estate, this condominium fits the bill.\r\rFor additional information or to arrange a viewing, contact us today! Hi, I'd like to find out more information about Hacienda de la Tortuga. Thanks so much!